As if paying tribute, exoplanets orbiting white dwarfs appear to be throwing their exomoons into hot atmospheres of these stellar husks. This fascinating conclusion comes from a recent study into white dwarf stars that appear to have atmospheres that are “polluted” with rocky debris. A white dwarf forms after a sun-like star runs out of hydrogen fuel and starts to burn heavier and heavier elements in its core. When this happens, the star bloats into a red giant, beginning the end of its main sequence life. After the red giant phase, and the star’s outer layers have been violently ripped away by powerful stellar winds, a small bright mass of degenerate matter (the white dwarf) and a wispy planetary nebula are left behind. But what of the planetary system that used to orbit the star? Well, assuming they weren’t so close to the dying star that they were completely incinerated, any exoplanets remaining in orbit around a white dwarf have an uncertain future. Models predict that dynamical chaos will ensue and gravitational instabilities will be the norm. Exoplanets will shift in their orbits, some might even be flung clear of the star system all together. One thing is for sure, however, the tidal shear created by the compact white dwarf will be extreme, and should anything stray too close, it will be ripped to shreds. Asteroids will be pulverized, comets will fall and even planets will crumble. Now, in a science update based on research published late last year in the journal Monthly Notices of the Royal Astronomical Society, astronomers of the Harvard-Smithsonian Center for Astrophysics (CfA) have completed a series of simulations of white dwarf systems in an attempt to better understand where the “pollution” in these tiny stars’ atmospheres comes from. To explain the quantities observed, the researchers think that not only is it debris from asteroids and comets, but the gravitational instabilities that throw the system into chaos are booting any moons — so-called exomoons — out of their orbits around exoplanets, causing them to careen into the white dwarfs. The simulations also suggest that as the moons meander around the inner star system and fall toward the star, their gravities scramble to orbits of more asteroids and comets, boosting the around of material falling into the star’s atmosphere. So there you have it, planets, should your star turn into a white dwarf (as our sun will in a few billion years), keep your moons close — your new stellar overlord will be asking for a sacrifice in no time. The most compact star-black hole binary has been discovered, but the star seems to be perfectly happy whirling around the massive singularity twice an hour. A star in the globular cluster of 47 Tucanae is living on the edge of oblivion. Located near a stellar-mass black hole at only 2.5 times the Earth-moon distance, the white dwarf appears to be in a stable orbit, but it’s still paying the price for being so intimate with its gravitational master. As observed by NASA’s Chandra X-ray Observatory and NuSTAR space telescope, plus the Australia Telescope Compact Array, gas is being pulled from the white dwarf, which then spirals into the black hole’s super-heated accretion disk. 47 Tucanae is located in our galaxy, around 14,800 light-years from Earth. Eventually, the white dwarf will become so depleted of plasma that it will turn into some kind of exotic planetary-mass body or it will simply evaporate away. But one thing does appear certain, the white dwarf will remain in orbit and isn’t likely to get swallowed by the black hole whole any time soon. “This white dwarf is so close to the black hole that material is being pulled away from the star and dumped onto a disk of matter around the black hole before falling in,” said Arash Bahramian, of the University of Alberta (Canada) and Michigan State University. “Luckily for this star, we don’t think it will follow this path into oblivion, but instead will stay in orbit.” Bahramian is the lead author of the study to be published in the journal Monthly Notices of the Royal Astronomical Society. It was long thought that globular clusters were bad locations to find black holes, but the 2015 discovery of the binary system — called “X9” — generating quantities of radio waves inside 47 Tucanae piqued astronomers’ interest. Follow-up studies revealed fluctuating X-ray emissions with a period of around 28 minutes — the approximate orbital period of the white dwarf around the black hole. 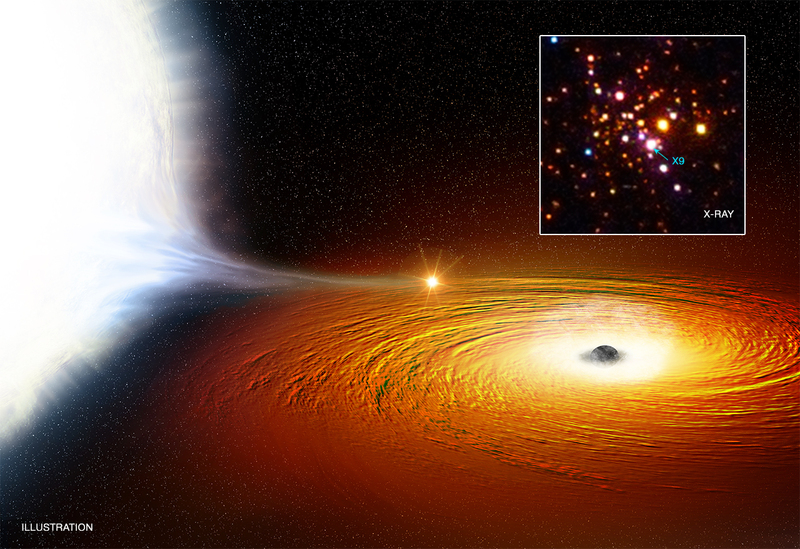 So, how did the white dwarf become the pet of this black hole? The leading theory is that the black hole collided with an old red giant star. In this scenario, the black hole would have quickly ripped away the bloated star’s outer layers, leaving a tiny stellar remnant — a white dwarf — in its wake. The white dwarf then became the black hole’s gravitational captive, forever trapped in its gravitational grasp. Its orbit would have become more and more compact as the system generated gravitational waves (i.e. ripples in space-time), radiating orbital energy away, shrinking its orbital distance to the configuration that it is in today. It is now hoped that more binary systems of this kind will be found, perhaps revealing that globular clusters are in fact very good places to find black holes enslaving other stars.